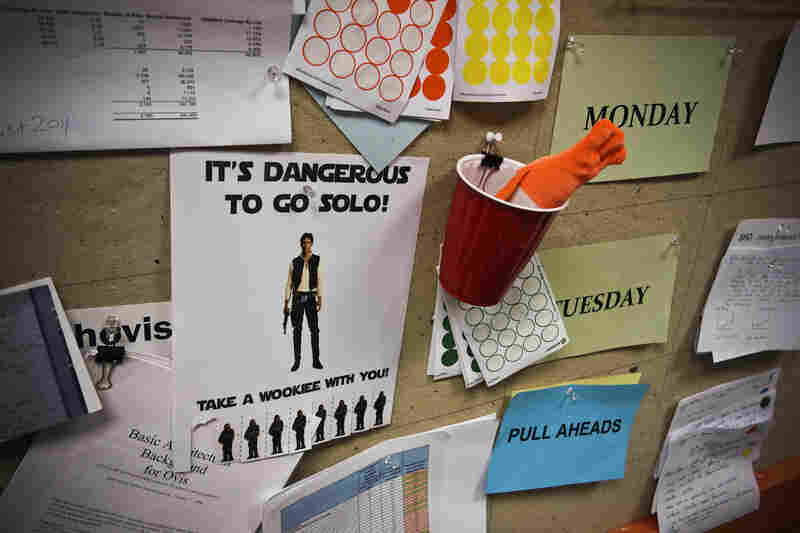 Inside The 'Bossless' Office, Where The Team Takes Charge : All Tech Considered In workplaces like Menlo Innovation, the whole office votes to hire, fire and give promotions. The team at Menlo says the lack of hierarchy makes for a more creative, happier place where the employees are always learning. 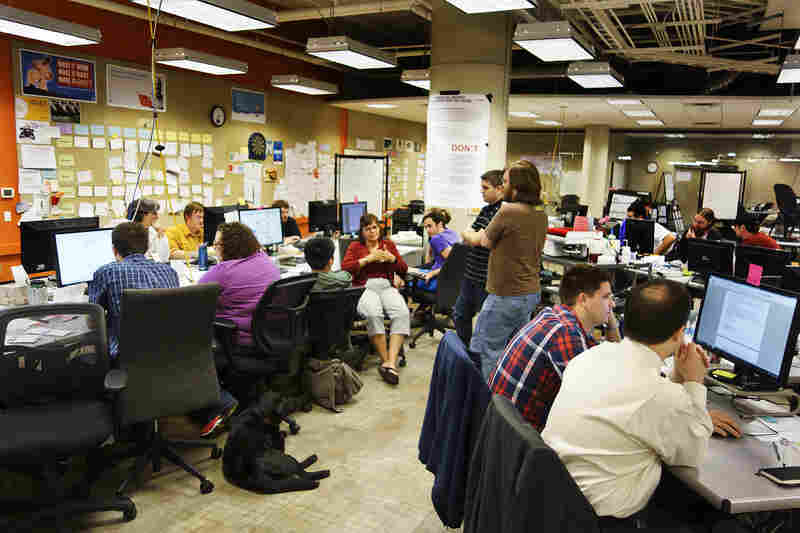 The headquarters of Menlo Innovations, a software design firm in Ann Arbor, Mich. At Menlo, there are no cubicles, few walls and no offices. 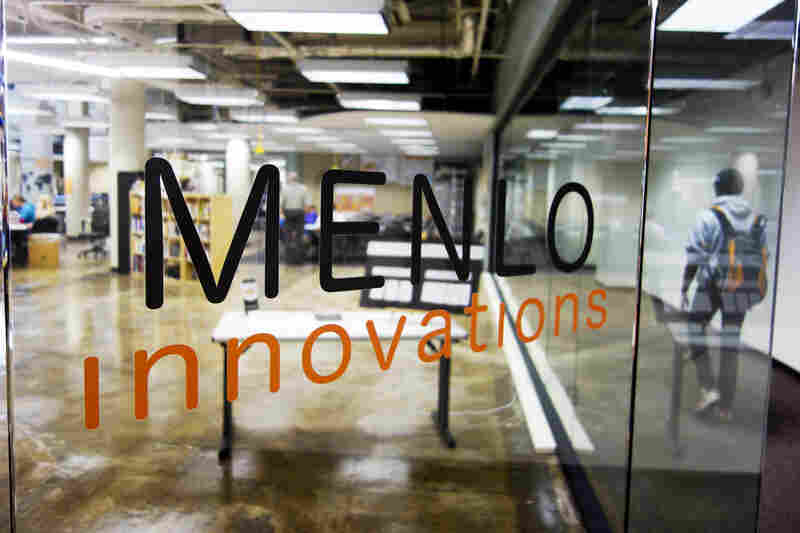 Menlo Innovations is staffed by about 50 employees, a mix of full-time staff and contractors. Rich Sheridan (standing at right) is Menlo's co-founder and CEO. Sheridan is the only "boss" at the company. But he doesn't serve as a boss in the traditional sense. 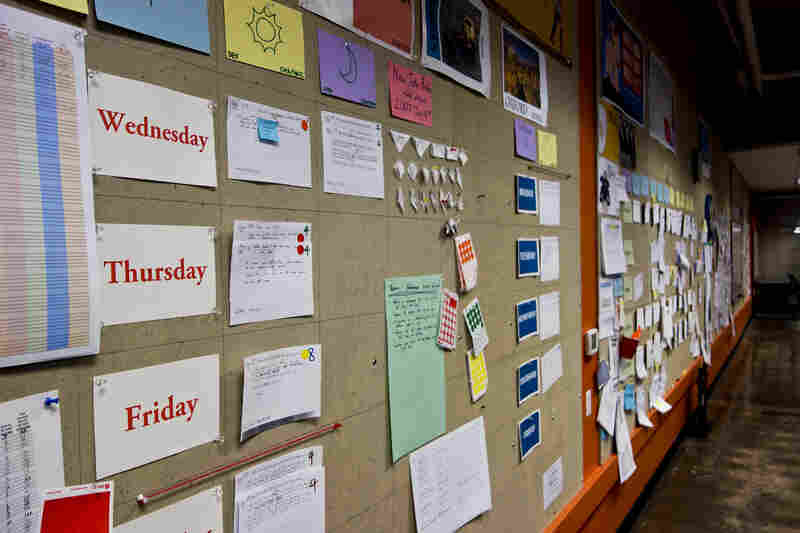 Menlo employees favor open communication that's conducted face-to-face or on paper, which they post on walls. 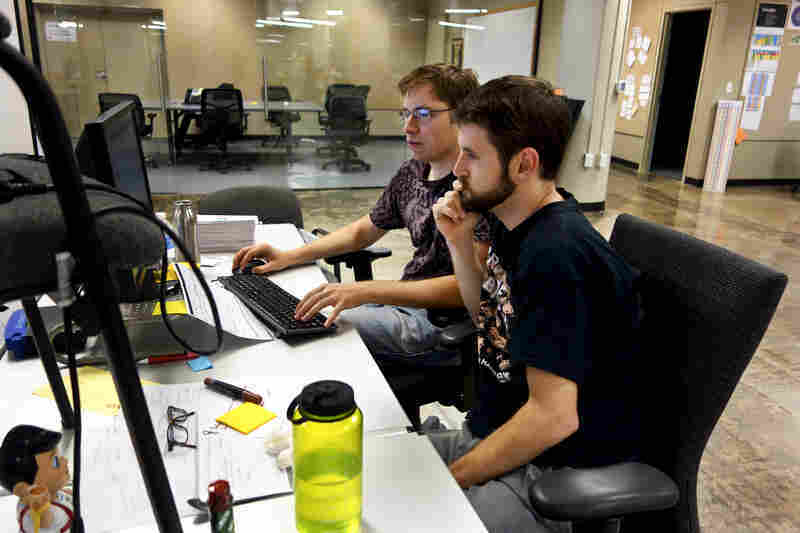 Menlo developers "pair programming" — two coders to a machine with one manning the keyboard. Menlo's office is full of kitschy signs and amusements to encourage "a culture of joy," as Menlo staff calls it. Developer Eric Schreffler (at left, wearing a suit) is getting his first performance review. 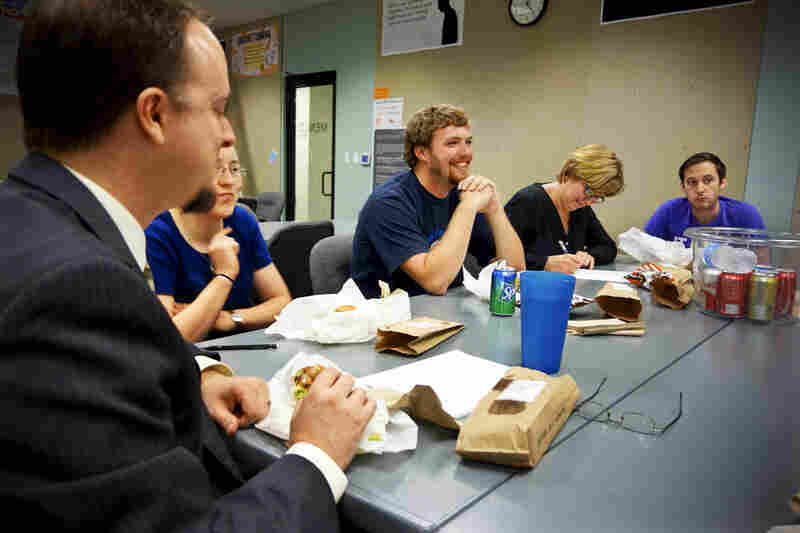 Since Menlo is a bossless office, a team of his colleagues gives feedback over lunch. Menlo encourages openness and transparency, so its budget is posted on the wall. 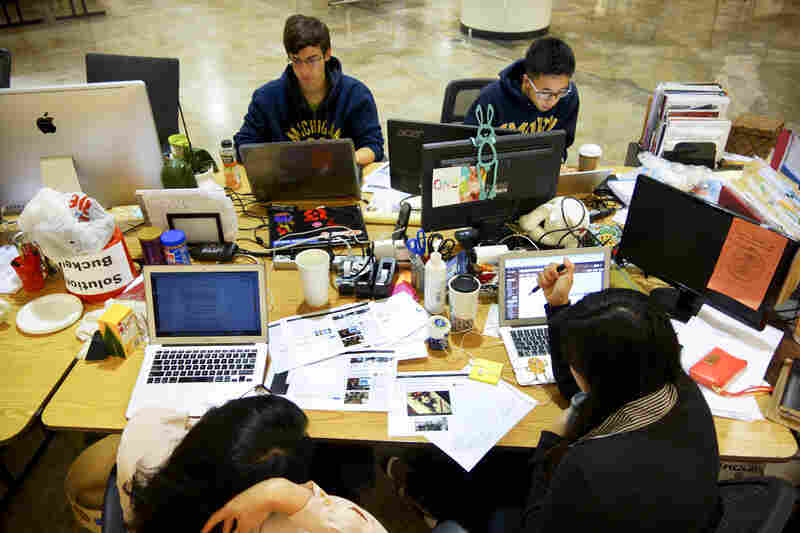 Employees work huddled around computers on desks they rearrange at will. Menlo's headquarters is underneath a parking garage in downtown Ann Arbor. Cubicle culture can be so confining that it's become a cliche. A line from the cult film classic Office Space sums it up: "I have eight different bosses right now," grouses bleary-eyed tech company employee Peter Gibbons. "So that means when I make a mistake, I have eight different people coming by to tell me about it. That's my only real motivation. It's not to be hassled." Today, the hierarchical hassles of the modern workplace are starting to fade, with a cultural move toward flat or "bossless" offices. In downtown Ann Arbor, Mich., the software company Menlo Innovations takes the flat office to its extreme — at Menlo, there are two co-founders and a CEO, but the team takes charge of budgeting, hiring, firing and making decisions on how to serve the company's clients. "If you look at a baseball team in the field, no one would say, hey who does the pitcher report to, who does the catcher report to? People who really understand baseball would say, well, they have a role to play but their real purpose is to win the game. To be on the field with each other and trust each other to know how to play," says Rich Sheridan, who co-founded Menlo in 2002 and is the company's CEO. The bossless atmosphere is reflected in the office layout. Menlo is headquartered just blocks away from the University of Michigan in 17,000 square feet of bright, open space. It's so open that the company's 50 employees (and a few of their dogs) work at long tables without walls, cubicles or offices. 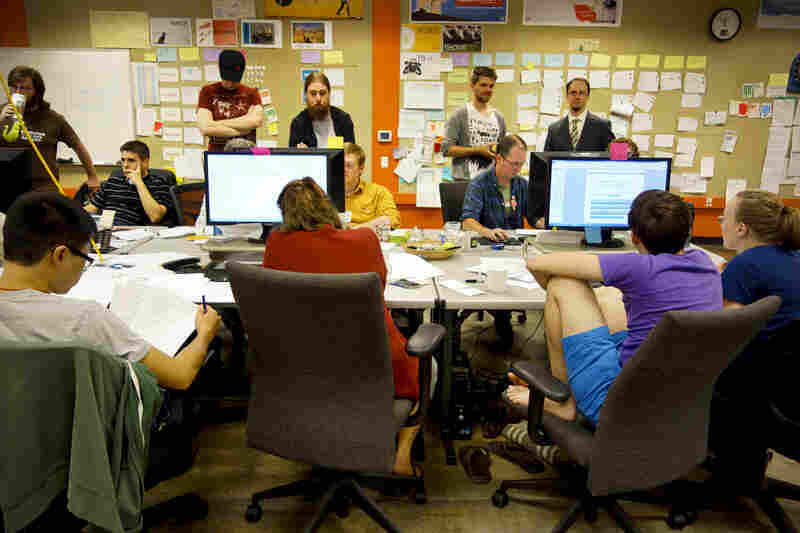 They code and design computer programs, but with a togetherness that makes it look more like a cafeteria lunchroom than a traditional workplace. 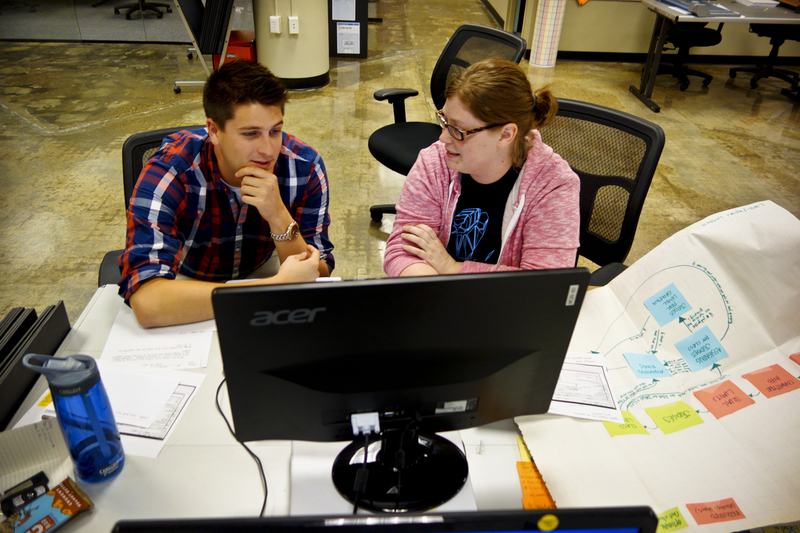 At Menlo, employees practice pair programming — they work two to a computer to facilitate constant feedback and communication. "I'm sitting out in the room with everyone else," Sheridan points out. "I get no special treatment; there's no corner office." That layout is by design. Sheridan says obliterating layers of management can lead to faster decision-making — and more important, motivated and empowered employees. At Menlo, the whole office, or sometimes subcommittees, decide who gets hired and who gets fired. Promotions, raises and budgeting are all decided by the team. 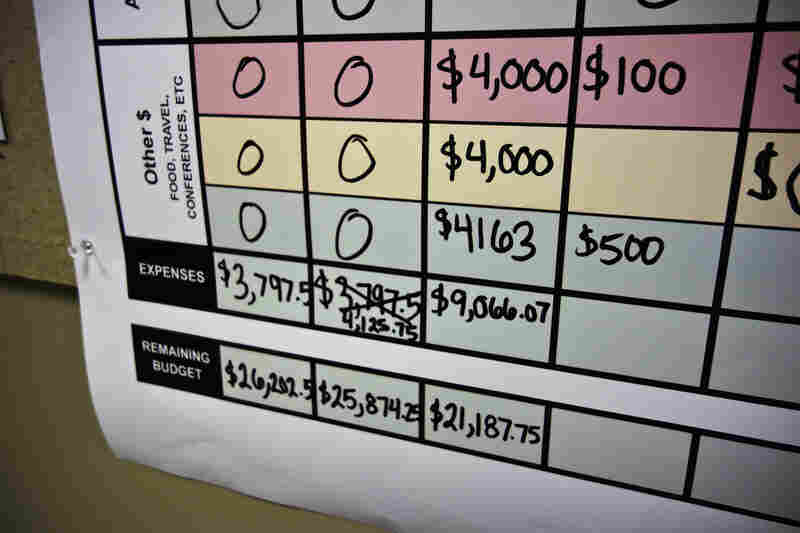 The company's emphasis on transparency extends to details like the budget, which is posted on the wall for everyone to see. Email communication is frowned upon in favor of face-to-face talking. "We've seen more of a trend toward flattening organizations," says Stephen Courtright, a Texas A&M business professor who specializes in studying self-governing offices. He says because the tech industry needs to adapt quickly and competition for the best employees is fierce, giving employees freedom helps them move much faster. "Those industries are just unstable, rapidly changing, and they are trying to harness creativity and innovation. So it is that speed of the technology environment that has prompted organizations to rethink the way they structure the organization," Courtright says. But it doesn't fix all problems. 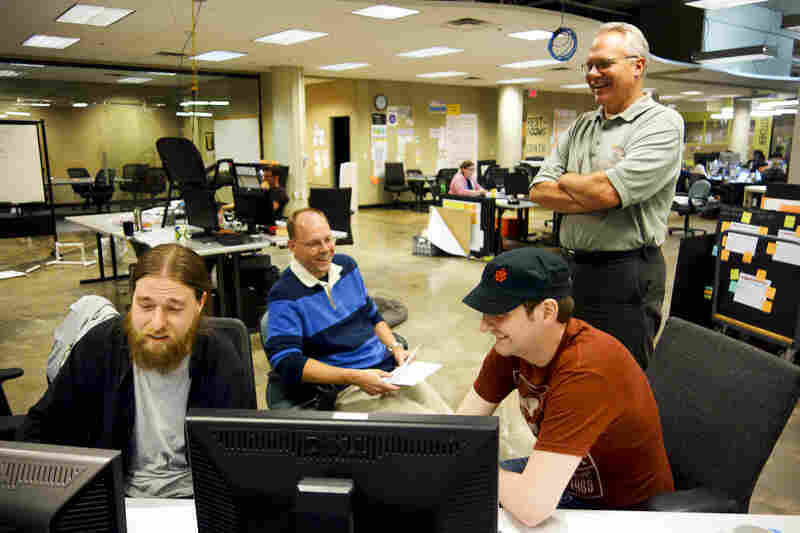 The gaming company Valve also boasts of being bossless and has gotten a lot of attention for it. But Jeri Ellsworth, a former programmer at Valve Corp., said her time there "felt a lot like high school." "What I learned from Valve is that I don't think it works," Ellsworth told The Grey Area podcast and reported in Wired magazine. "I think that if you give complete latitudes with no checks and balances, it's just human nature [employees] are gonna try to minimize the work they have to do and maximize the control they have." At Menlo, the employees say the culture prevents that. "It really doesn't happen that way," says Menlo developer Eric Schreffler. "And that's partly because of the people who were here from the beginning." As more companies shift to flatter structures, Courtright says workers should decide what rewards you're seeking at work when making job decisions. "In a flat organization, moving up the chain of command is not the reward for performing well, because in a flat organization there's not a big chain of command to climb up. Basically the reward in a flat organization is being able to work on new and challenging creative tasks," Courtright says. And that newness is what keeps Menlo's Lisa Ho coming back. "We say we're a learning organization, so we're always learning and trying new things, which is very cool," she says. This post originally said that former Valve employee Jeri Ellsworth's comments were made in a Wired magazine podcast. The podcast is actually the Grey Area podcast and Ellsworth's comments were reported by Wired.